Yesterday I posted a hack which adds an old style RT button to the new Twitter website. Here’s the full post on what it is, and why I did it. Twitter re-invented the community-bred retweet function over a year ago. The reasons for this are debatable and people tend to have personal preferences on the issue. Personally I think they did it for two reasons: To improve data integrity, and to lower the barriers for participation for new users. Twitter are making bold moves to conquer the ‘mainstream’ and making it easier to contribute content is important – Look no further than Facebook’s like button, to understand that. Regardless of your personal preference, the fact is that Twitter don’t have control over every desktop and mobile client out there. (well, not yet). The problem for Twitter is how to ensure that data is put into their system the way they want it. As a Twitter user (not as a developer) I prefer the old style RT. Why? Because I am selfish and vain. I want to add my own comment to the content I am forwarding on. I’m not sharing it with you entirely for your own good (selfish) – I want you to know what I think about it too. I also want to be notified when I’m retweeted (vain), and I want to know what you think about it too. I also think the old style RT is an important part of the Twitter subculture, something that I feel will die out if Twitter truly conquer the mainstream. The new twitter.com website has no UI elements to support the old style RT. (For the record, the old site doesn’t either). Performing an old style RT is made hard – or at least deliberately omitted as a feature. 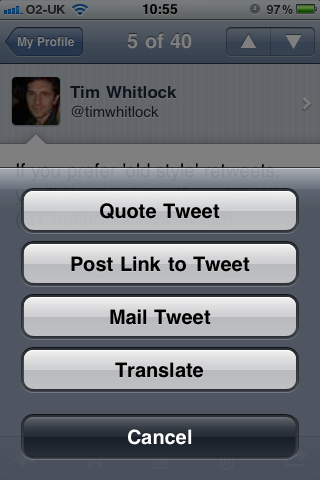 The official iPhone client has a “Quote tweet” button, possibly a throw back to its independence as Tweetie 2. I’m interested to see whether Twitter add a “Quote tweet” button to twitter.com, or whether they remove it from the iPhone client. I see no reason why users’ preferences can’t be facilitated, as well has Twitter’s own requirements. Perhaps the retweet model will shift again. So, if you’re using the new Twitter and finding yourself annoyed that the UI is telling you how to use the service, then try out my button. I haven’t got access to a machine running IE so I’m not sure what’s happening there. Maybe the selector is a bit too heavy for IE?